Yesterday, talk show host Bob Lonsberry, who has shows on Rochester's WHAM and Syracuse's WSYR, was at the New York State Fair doing live remotes for WSYR. He went through the dairy barn where he came across Emory Seefeldt and his mom Amy who hail from Gasport View Dairy. Bob conducted an awesome interview with them. You can listen to the 11-minute interview on WSYR's podcast. 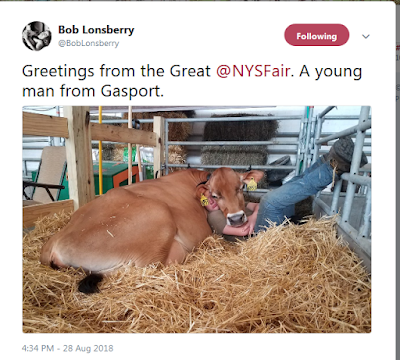 It begins at the 18:00 mark on the "Lonsberry at the Fair: Day 7" podcast for the 4:00 PM hour. Amy and Emory (and Bob Lonsberry for that matter) are great spokespersons for dairy. Emory also had a great quote about farming and the life lessons it gives. The link is here. To listen, you will need an I Heart Radio account, or you can log-in via Facebook.